Health effects from indoor air pollutants can be avoided. Whole house air purification systems remove contaminants from the air in a room. The EPA divides contaminants into two categories: particulate matter and gaseous pollutants. Particulates come from things like dust, smoke, animal dander, or from combustion in the home such as stoves and fireplaces. Gaseous pollutants come from materials found in and around the house like stoves and tobacco smoke. In addition to particulates and gaseous pollutants, gasses called VOC’s volatile organic compounds are introduced into the home from household products like paint, and cleaning products. When it comes to choosing an air purifier, the options can be overwhelming and the best one really depends on the types of contaminants in your home. 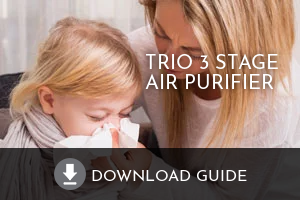 Our top recommendations include scheduling indoor air quality testing, or investing in one of the top air purifiers like the Field Controls Trio. The ideal indoor air humidity level is around 30-40%, but here in Wisconsin especially in winter, our humidity levels are closer to only 10%. When the indoor humidity level is below 30 percent, the air is too dry, which can harm both a home’s structural integrity and the homeowners’ health. Adding a whole-house humidifier to your furnace can help soothe common problems caused by dry indoor air like dry skin, colds and flu, cracked hardwood floors, and more. Both Honeywell and Aprilaire whole-house humidifiers are by far the most popular choices for homeowners and businesses. When humidity levels indoors exceed 50% it creates a breeding ground for allergens, musty odors, condensation on windows, and warp and rot of hardwood floors and furniture. And, knowing humid air feels warmer, excessive humidity means you’ll likely want to run your cooling system more. But even with more AC, the excessive humidity will result in a cold, clammy environment. A whole-house dehumidifier is the ideal solution to monitor and adjust the humidity levels indoors. Balanced whole-house ventilation systems are designed to remove stale air from your home while keeping valuable energy from escaping all year round. Often, a balanced system involves a powered heat recovery or energy recovery ventilator (HRV or ERV) that improves efficiency and pressure balance by exchanging energy (from temperature and humidity differences) between the outgoing and incoming airstreams. While both types of ventilators quietly replace stale indoor air with fresh outside air, ERVs are especially effective in areas that have sticky, humid summers because they transfer sensible heat and moisture from humid air, while HRVs are ideal for areas with long winters and shorter, drier summers because they transfer only sensible heat. Ultraviolet lights are used to zap airborne contaminants while inside your duct work, before they reach the air you breath. Your options range from a basic UV light that keeps your coil dry (preventing mold growth in your HVAC system), to more sophisticated options suited for those with asthma, allergies, or who are simply sensitive to biological contaminants. The Field Controls Healthy Home Duo combines a powerful UVC germicidal light with a patented PRO-CellTM technology to help neutralize airborne contaminates and reduce VOCs and odors. You deserve to breath healthy air. Avoid the health effects from indoor air pollutants with the indoor air quality products that are right for your home. To schedule an indoor air quality test or installation of any of the indoor air quality products above, contact our Milwaukee Indoor Air Quality experts online, or call 414.384.4822.